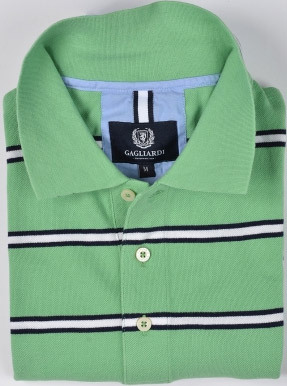 A POLO SHIRT, also known as a golf shirt and tennis shirt, is a T-shaped shirt with a collar, typically a two- or three-button placket, and an optional pocket. Polo shirts are usually made of knitted cloth (rather than woven cloth), usually piqué cotton or, less commonly, silk, merino wool, or synthetic fibers. In the 19th and early 20th centuries, tennis players ordinarily wore "tennis whites" consisting of long-sleeved white button-up shirts (worn with the sleeves rolled up), flannel trousers, and ties. This attire presented problems for ease of play and comfort. René Lacoste, the French 7-time Grand Slam tennis champion, decided that the stiff tennis attire was too cumbersome and uncomfortable. He designed a white, short-sleeved, loosely knit piqué cotton (he called the cotton weave jersey petit piqué) shirt with an unstarched, flat, protruding collar, a buttoned placket, and a longer shirt-tail in back than in front (known today as a "tennis tail"), which he first wore at the 1926 U.S. Open championship. Beginning in 1927, Lacoste placed a crocodile emblem on the left breast of his shirts, as the American press had begun to refer to him as "The Crocodile", a nickname which he embraced. PIQUÉ refers to a weaving style, normally used with cotton yarn, which is characterized by raised parallel cords or fine ribbing. It creates a fine textured surface that appears similar to a waffle weave. Commonly used for polo shirts. 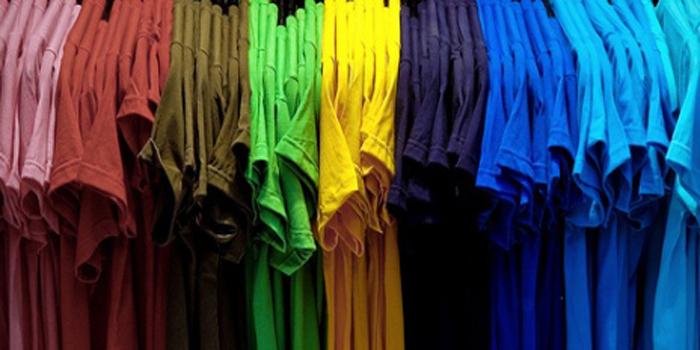 A T-SHIRT is a shirt which is pulled on over the head to cover most of a person's torso. A T-shirt is usually buttonless and collarless, with a round neck and short sleeves. T-shirts are typically made of cotton or polyester fibers (or a mix of the two), knitted together in a jersey stitch that gives a T-shirt its distinctive soft texture. T-shirts can be decorated with text and/or pictures, and are sometimes used to advertise. The T-shirt evolved from undergarments used in the 19th century, through cutting the one-piece "union suit" underwear into separate top and bottom garments, with the top long enough to tuck under the waistband of the bottoms. T-shirts, with and without buttons, were adopted by miners and stevedores during the late 19th century as a convenient covering for hot environments. Following World War II it became common to see veterans wearing their uniform trousers with their T-shirts as casual clothing, and they became even more popular after Marlon Brando wore one in A Streetcar Named Desire, finally achieving status as fashionable, stand-alone, outer-wear garments. A T-shirt typically extends to the waist. Variants of the T-shirt, like the tank top, crew neck, A-shirt (with the nickname "wife beater"), muscle shirt, scoop neck, and the V-neck have been developed. Hip hop fashion calls for "tall-T" T-shirts which may extend down to the knees. A 1990s trend in women's clothing involved tight-fitting "cropped" T-shirts that are short enough to reveal the midriff. Another popular trend is wearing a "long-sleeved T-shirt", then putting a short-sleeved T-shirt of a different color over the long-sleeved shirt; this is known as "layering". A HENLEY shirt is a collarless men's casualwear pullover shirt, characterized by a 4-6" long slit beneath the round neckline, usually having 2-5 buttons. It essentially resembles a collarless polo shirt. The sleeves may be either short or long sleeve, and it can be made in almost any fabric, although cotton and cotton-polyester blends are by far the most popular. Henley shirts are generally regarded as menswear, although women sometimes wear them, too. 6 Simple Striped Shirts for Summer - The New York Times. 10 of the best men's T-shirts - The Telegraph. 10 of the best polo shirts for men - The Telegraph. 20 polo shirts to brighten up your spring wardrobe - The Telegraph. A New Wrinkle in Logo Dressing - The New York Times. been there, done that, bought the T-shirt - "Expresses the speaker's complete familiarity with a situation, with overtones of cynicism or exhaustion." Is Prada’s £270 white T-shirt pure ‘filth’ - or a designer bargain? - "The internet has been up in arms over the brand’s plain white cotton top, but, shockingly, it doesn’t come close to being the world’s most expensive T-shirt." PiquÉ (weaving) - or marcella, refers to a weaving style, normally used with cotton yarn, which is characterized by raised parallel cords or geometric designs in the fabric. Piqué fabrics vary from semi- sheer dimity to heavy weight waffle cloth. Polo shirt - also known as a golf shirt and tennis shirt, is a form of shirt with a collar, a placket with typically two or three buttons, and an optional pocket. Suits & T-shirts: the last tailoring frontier? - The Telegraph. Upturned collar: tennis shirts - is an otherwise flat, protruding collar of either a shirt, jacket, or coat that has been turned upward. With the advent of the tennis shirt, however, the upturned collar took on a whole new purpose. In 1929 René Lacoste, the French 7-time Grand Slam champion, decided that the stiff dress shirts and ties usually worn by tennis players were too cumbersome and uncomfortable for the tennis court. Instead, he designed a loosely-knit piqué cotton shirt with an unstarched, flat protruding collar and a longer shirt-tail in back than in front. This came to be known as the tennis shirt. Lacoste's design called for a thick piqué collar that one would wear turned up in order to block the sun from one's neck. Thus, the tennis shirt's upturned collar was originally designed by the inventor of the tennis shirt, himself, for ease and comfort on the tennis court, aiding the player by helping to prevent sunburn. Watch: how to fold a T-shirt in two seconds - The Telegraph. Why it's time to dust off your polo shirt - The Telegraph. 3.1 PHILIP LIM - men's T-shirts. 3.1 PHILIP LIM - women's T-shirts. ACNE Studios - men's T-shirts. ACNE Studios - women's polos & T-shirts. Adam Lippes - women's T-shirts. Adidas - men's polo shirts. AIRBUS - men's polo shirts. AIRBUS - women's polo shirt. ALAIN FIGARET - men's polo shirts. ALEXANDER MCQUEEN - men's polo shirts. ALEXANDER MCQUEEN - men's T-shirts. ALEXANDER MCQUEEN - women's T-shirt. AMI Paris - men's polos & T-shirts. Anderson & Sheppard - "Savile Row Bespoke Tailors since 1906." Men's polos & T-shirts. Angelo Galasso - men's T-shirts. A.P.C. - men's polos & T-shirts. Arkwear - men's. 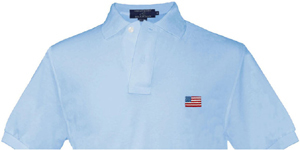 "Shop luxury mens polo shirts with quality soft Pima cotton/spandex. Embroidered with endangered animals, 5% of sales benefits the Wildlife Conservation." ASCOT CHANG - short & long sleeve polos, mock necks & T-shirts. ASTON MARTIN - men's polos & T-shirts. ASTON MARTIN - women's 007 polo shirt. BALLY - men's polo shirts. Band of Outsiders - men's polo shirts. Band of Outsiders - men's T-shirts. Barbour - since 1894. Men's polo shirts. Barbour - since 1894. Women's polo shirts. Ben Sherman - men's polo & T-shirt. BENTLEY - men's polos & T-shirts. BENTLEY - women's polos & T-shirts. BERETTA - men's polo shirts. BERETTA - women's polo shirts. BERLUTI - Paris since 1895. "The ultimate expression of luxury for men." Polo & T-shirts. BEVERLY HILLS POLO CLUB - men's T-shirts. Billionaire Couture - men's polo shirts. Billy Reid - men's polos & henleys. Billy Reid - men's T-shirts. Billy Reid - women's T-shirts. Bonaval - men's polo & T-shirts. BOSS - men's polo shirts. BOTTEGA VENETA - men's polos & tees. Breton Shirts - men's T-shirts. Breton Shirts - women's T-shirts. BRIONI - since 1945. Men's designer polos & T-shirts. Brook There - women's organic T-shirts. Brooklyn Tailors - since 2007. Men's polo shirts. Brooklyn Tailors - since 2007. Men's T-shirts. BROOKS BROTHERS - since 1818. Men's polos, rugbys & tees. BROOKS BROTHERS - women's polo shirt. bugatchi - men's polo shirts. BUGATTI - men's polos & T-shirts. Burberry - men's polos & T-shirts. Burberry - women's polos & T-shirts. CARVIL - Paris since 1952. Men's polo shirts. CARVIL - Paris since 1952. Men's T-shirts. CARVIL - Paris since 1952. Women's polo shirts. CARVIL - Paris since 1952. Women's T-shirts. Casely-Hayford - since 2009. "English Luxury Menswear House." Men's T-shirts. CÉline Dion Collection - women's polos & T-shirts. Charles Tyrwhitt - since 1986. Jermyn Street, London. Men's T-shirts. Cheap Monday - men's T-shirts. Club Monaco - men's polos & T-shirts. CoStume National - men's polos & T-shirts. Current / Elliott - men's T-shirts. Current / Elliott - women's T-shirts. Desmond & Dempsey - since 2014. Men's T-shirts. DEREK ROSE OF SAVILE ROW - men's T-shirts. DEREK ROSE OF SAVILE ROW - women's T-shirts. DIESEL - men's polo shirts. Dior - men's polos & T-shirts. DOLCE & GABBANA - men's polos & T-shirts. DOLCE & GABBANA - women's T-shirt. DOMENICO VACCA - men's polo shirts. DUNHILL - men's polo shirts. ERMENEGILDO ZEGNA - men's polos & T-shirts. FAÇONNABLE - since 1950. Men's polos. FAÇONNABLE - since 1950. Men's T-shirts. FALKE - women's polos & T-shirts..
Ferrari - men's polo shirts. Ferrari - women's polo shirts. FILSON - "Building on a heritage of guaranteed quality since 1897." Men's T-shirts. Flouzen Paris - men's T-shirts. FORZIERI - men's polo shirts. FRED PERRY - men's piqué shirts. FRED PERRY - women's piqué shirts. Gagliardi - since 1964. Men's polo shirts. G. Inglese Sartoria - men's polo shirts. GRESHAM BLAKE - men's T-shirts. Gucci - men's polos & T-shirts. HACKETT - men's polos & rugby shirts. HACKETT - men's T-shirts & sweatshirts. Hanro of Switzerland - men's T-shirts. Hanro of Switzerland - women's T-shirts. Harrods - men's polo shirts. HARVIE & HUDSON - men's polo T-shirt. Helmut Lang - men's T-shirts & sweatshirts. Helmut Lang - women's T-shirts. HENRI LLOYD - men's polo shirts. HENRI LLOYD - men's T-shirts. HENRI LLOYD - women's T-shirts. Holderness & Bourne - men's polo shirts. House of Holland - men's T-shirts. House of Holland - women's T-shirts. HUGO BOSS - men's polo shirts. HUGO BOSS - men's T-shirts. Intimissimi - men's T-shirts - man nightwear. J.LINDEBERG - men's polos & T-shirts. JACK WILLS - men's polo shirts. JACK WILLS - men's T-shirts. JACK WILLS - women's T-shirts. JAEGER - men's polos & T-shirts. Jigsaw - men's polos & T-shirts. John Malkovich - men's T-shirt. JOHN SMEDLEY - since 1774. Men's polo shirts. JOHN SMEDLEY - since 1774. Men's T-shirts. JOHNSTON & MURPHY - since 1850. Men's polos & T-shirts. JONATHAN SAUNDERS - men's T-shirts. Jupe by Jackie - men's embroidered T-shirts & polos. Katie Eary - men's & women's T-shirts. KENNETH COLE - men's polos & T-shirts. KENNETH COLE - women's T-shirts. Kent & Curwen - men's T-shirts. KRIS VAN ASSCHE - men's T-shirts. LA MARTINA - men's polo shirts. LA MARTINA - men's T-shirts. LA MARTINA - women's polo shirts. LA MARTINA - women's T-shirts. LACOSTE - since 1933. Men's polo shirts. LACOSTE - women's polo shirts. LOEWE - since 1846. Men's polo shirts. LOEWE - since 1846. Men's T-shirts. Louis Vuitton - men's polos & T-shirts. LORD'S - since 1814. "The Home of Cricket." Men's polo shirts. LORD'S - since 1814. "The Home of Cricket." Women's T-shirts. LORO PIANA - since 1924. Men's cotton & silk piqué polo shirt. LOTUS - men's polo shirt. Magee - since 1866. Men's polo shirts. Magee - since 1866. Men's T-shirts. MAISON KITSUNÉ - men's polos & T-shirts. MAISON KITSUNÉ - women's polos & T-shirts. Marc Jacobs - men's T-shirts. Marc Jacobs - women's T-shirts. MASSIMO SFORZA - men's polo shirts. Max Mara - women's T-shirts. MICHAEL KORS - men's polos & T-shirts. MICHAEL KORS - women's T-shirt. Michael Stars - men's T-shirts. Michael Stars - women's T-shirts. MICHAEL TOSCHI - men's polo shirts. MILE HIGH CLUB STORE - men's T-shirts. Miguel Caballero - men's & women's bulletproof T-shirts. Mission Workshop - men's T-shirts. M.Nii - Waianae, Oahu, Hawaii. Men's T-shirts. MUSTO - men's polos & T-shirts. MUSTO - women's polos & T-shirts. NEW & LINGWOOD - since 1865. 53 Jermyn Street, London. Men's polo shirts. NICOLE FARHI - men's T-shirts. NICOLE FARHI - women's T-shirts. Organic Basics - "Better Greener Basics. For the highest comfort of you & the environment." Men's T-Shirts. Organic Basics - "Better Greener Basics. For the highest comfort of you & the environment." Women's T-Shirts. Orlebar Brown - men's polo shirts. Orlebar Brown - men's T-shirts. Orlebar Brown - women's T-shirts. Outdoor voices - men's T-shirts. Outdoor voices - women's T-shirts. Pansy - "Organic cotton underwear company." Women's T-shirts. PARIS HILTON - women's T-shirts. PAUL SMITH - men's polo shirts. PAUL SMITH - men's T-shirts. PAUL SMITH - women's T-shirts. PERRY ELLIS - men's polos & T-shirts. Philippe Perzi - men's polo shirts. PIRELLI PZERO - men's polo shirts. PIRELLI PZERO - men's T-shirt. PIRELLI PZERO - women's T-shirt. Polo Ralph Lauren - men's polo shirts. Polo Ralph Lauren - men's T-shirts. Polo Ralph Lauren - women's polo shirts. Polo Ralph Lauren - women's T-shirts. Porsche - men's polo shirts. Porsche - women's polo shirts. Prps - since 2002. Men's T-shirts. Prps - since 2002. Women's T-shirts. Psycho Bunny - men's polo shirts. Psycho Bunny - men's T-shirts. Rag & Bone - men's T-shirts. Rag & Bone - women's T-shirts. Ralph Lauren - men's polo shirts. Ralph Lauren - men's T-shirts. Ralph Lauren - women's polo shirts. Ralph Lauren - women's T-shirts. ResterÖds - "Swedish heritage fashion since 1935." Men's T-shirts. Richard James - Savile Row, London, U.K. Men's polos & T-shirts. R.M.Williams - since 1932. Men's polos & T-shirts. RUBINACCI - men's polo shirts. Saint James French Clothing - since 1889. Men's polo shirts. Saint James French Clothing - since 1889. Men's striped T-shirts. Saint James French Clothing - since 1889. Women's striped T-shirts. Sandro - men's polos & T-shirts. Sloane & Tate - "The collection is sustainably sewn in Los Angeles." Women's T-shirts. SMATHERS & BRANSON - men's needlepoint polo shirts. Smith & Wesson - men's polo shirts. Smith & Wesson - men's T-shirts. Smith & Wesson - women's T-shirts. Sonia Rykiel - women's T-shirts. ST. CROIX - handcrafted in the USA since 1960. Men's polo shirts. Stefano Ricci - men's T-shirts & polos. Stella McCartney - men's T-shirts. Stella McCartney - women's T-shirts. STETSON - "Made of America." Men's T-shirts. STETSON - "Made of America." Women's T-shirts. STONE ISLAND - men's polo shirts. STONE ISLAND - men's T-shirts. SUNSPEL - since 1860. Men's polo shirts. SUNSPEL - since 1860. Men's T-shirts. SUNSPEL - since 1860. Women's polo shirt. SUNSPEL - since 1860. Women's T-shirts. Surface to Air - men's T-shirts. SØrensen - men's polo shirts. The Kooples - men's polo shirts. The Kooples - men's T-shirts. The Kooples - women's T-shirts. The Line - men's & women's T-shirts. THOM BROWNE - men's polos & T-shirts. THOMAS DEAN - men's polo shirts. THOMAS PINK - Jermyn Street, London. Men's polo shirts. THOMAS PINK - Jermyn Street, London. Men's T-shirts. THREADLESS - men's & women's new graphic T-shirts released weekly. TIMBERLAND - men's polo shirts. Todd Snyder - men's polo shirts. Todd Snyder - men's T-shirts. Todd Snyder - women's T-shirts. Tomas Maier - men's polos & T-shirts. TOMMY HILFIGER - men's polo shirts. TOMMY HILFIGER - men's T-shirts. TOMMY HILFIGER - women's polo shirts. TOMMY HILFIGER - women's T-shirts. VAN LAACK - men's polo shirts. VAN LAACK - women's polo shirts. VICOMTE A. - men's polo shirts. VICOMTE A. - men's T-shirts. VICOMTE A. - women's polo shirts. Vince - men's polos & T-shirts. William Hunt - 41 Savile Row, London. Men's polo shirts. Won Hundred - men's T-shirts. YVES SAINT LAURENT - men's polos & T-shirts. Zachary Prell - men's polo shirts. Zachary Prell - men's T-shirts. ZADIG & VOLTAIRE - men's T-shirts. ZADIG & VOLTAIRE - women's T-shirts. ZEGNA - men's polos & T-shirts. Zilli - men's silk-cotton polo shirt. Zoe Karssen - men's T-shirts. Zoe Karssen - women's T-shirts.